Ever find that you’re spending loads of money on food every week, but seem to be throwing out mushy veg or out of date meat? We’ve created a list of kitchen hacks to help you save on groceries and waste less food. A cucumber kept shrinkwrapped will stay fresh for three times longer than one taken out of its packaging. This works for bagged food too, don’t be tempted to pierce a bag of lettuce to get the air out so you can fit more into your salad drawer. A lot of the time the air in those bags isn’t normal air, it’s a “modified atmosphere” which has less oxygen and more nitrogen to slow down the decomposition process. That’s enough science, but basically, keep your veg sealed until you want to use it. Most recipes and packets of food from the supermarket will serve four people, which is no good if it’s got a short date and you’re cooking for one person. If you’ve got a freezer it’s a much smarter to make enough for four and freeze the rest within two hours. Just make sure the food is piping hot all the way through when you eat your frozen meal. 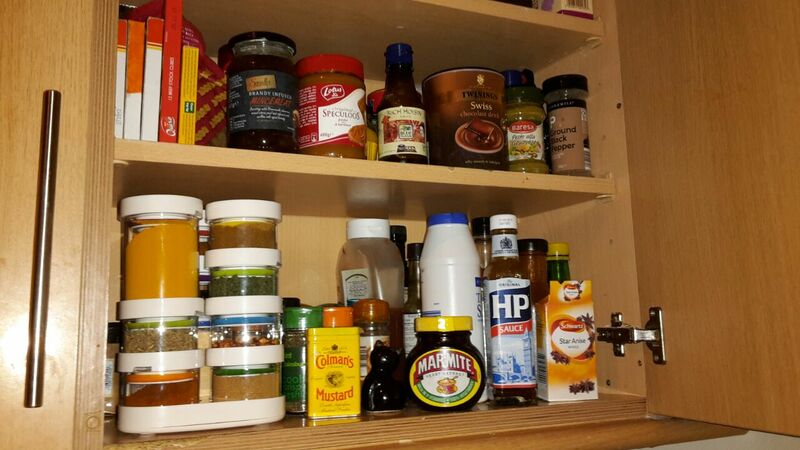 It’s hard not to be tempted by supermarket special offers, but if you take a picture of your cupboards (or a “shelfie”) for you to look at as you shop, you can avoid buying things you already have. We mean it, you can chop a spring onion up almost down to the root and put the very end of it into a shot glass of water and it’ll grow back in no time. Then just snip it back down to the root and grow it again. This image shows you the other things you can grow back, but take it with a pinch of salt, we’ve had a pineapple head planted for well over a year, and there’s no sign of a new pineapple growing from it any time soon. There’s no point freezing extra food if in order to use a single chicken breast you’ll need to defrost enough for six, or try and chisel one out of a solid block. Freezer bags will take up the least room in your freezer, but plastic Chinese takeaway pots are both thifty and reusable. Grab a permanent marker and label your containers, unless you fancy eating spaghetti chilli con carne one day! There’s only one way to tell if an uncracked egg is still fresh, and that’s to put it into a bowl of water. To do this put your egg in a bowl (a glass bowl is easiest to do this with) with enough water to cover it by at least a few centimetres. 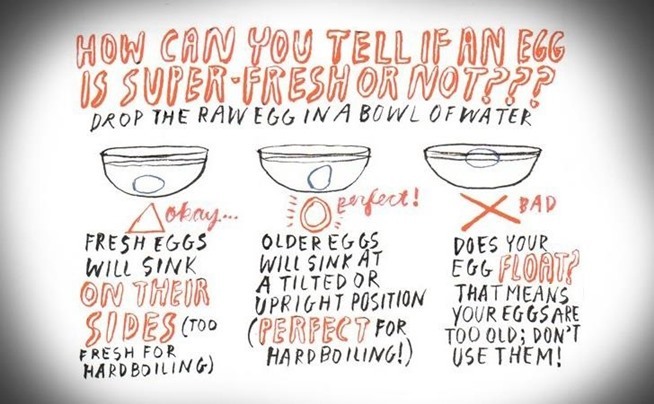 If the egg is lying on its side it’s very fresh and is perfect for poached eggs, if one end is raised but it’s still touching the bottom it’s less fresh but still great for scrambled or boiled eggs, and if the egg is completely floating then it’s best you throw it away. Eggs - these are fine in or out of the fridge, but they’ll keep a little longer if they stay refrigerated. Bread - some people keep bread in the fridge, but it goes stale much more quickly in the cold, keep it in a cool, dark place (like a cupboard or bread bin) for extra life. If you’re not going to get through a loaf, throw the rest in the freezer ready for toast. Cheese and ham or bacon - once you’ve opened a block of cheese or packet of ham/bacon make sure to wrap it up tightly before it goes back in the fridge. Any exposed parts will dry out and won’t be very appetising. Potatoes - keep these out of the fridge in a cool dark place. Carrots - these are best kept refrigerated with the leafy parts chopped off, and you can line your veg drawer with kitchen roll to absorb extra moisture - it should help your carrots stay crisp. Tinned food - if you only eat half a tin of beans, you shouldn’t put the tin half full of food into the fridge for your next meal. It’s safer to pour it out into a bowl or plastic container. Mushrooms - if they come pre-packaged keep them sealed, but loose ‘shrooms should be kept in the fridge in a paper or damp cloth bag, they’ll spoil in a plastic bag. For more ideas to save money and cut down on waste have a look at Love Food Hate Waste.